HIGH SPEED WIRELESS INTERNET!! BRING YOUR LAPTOP! We have security enabled wireless internet. WENDOVER DUNES, Palmetto Dunes newest neighborhood (completed April, 2002), is located in the prestigious Leamington area next to the Barrington Enclave, just 200 yards to the Atlantic Ocean. This villa (brand-new April, 2002) features 2 master bedroom suites, each with spa tub, separate shower and walk-in closet. The first master suite by the screened veranda features a King size bed while the second master bedroom also has a King bed and veranda. The foyer entrance features a half bathroom and hallway to front master bedroom and living/dining room. The open floor plan offers a fully equipped kitchen with Corian counters, 9 ft. ceilings, large living and dining areas professionally designed and luxuriously furnished in the British West Indies style. The living room has a sleeper sofa, large screen TV and internet capabilities. 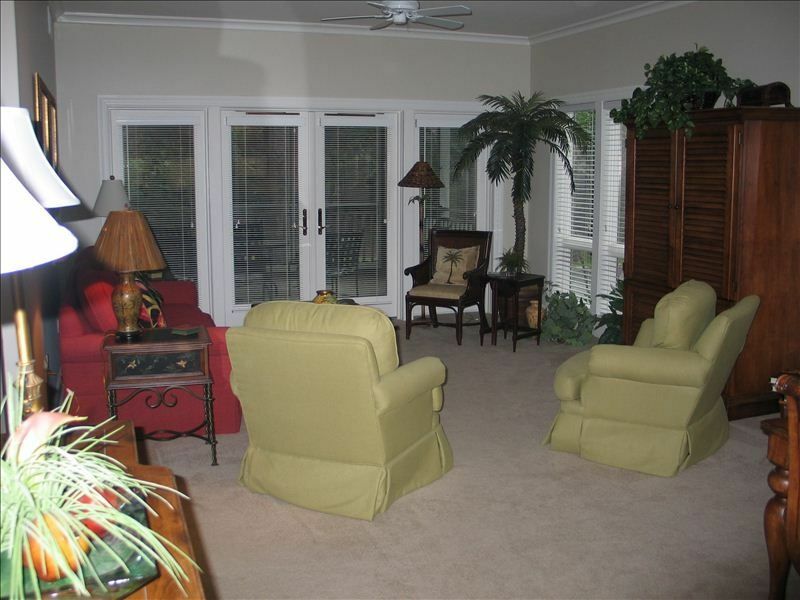 Enjoy the comfort of ceiling fans on the private, full-length, screened verandah. There are only four units in each of ten buildings in Wendover Dunes. Our villa is a 1st-floor villa with over 1600 square feet of living area. There is covered parking and a landscape view. The beach is only a 3-4 minute walk past the pool and a path between Somerset and Barrington oceanfront complexes. The shared beautifully designed pool area features a Jacuzzi, separate children's pool, lovely gardens, grill area and direct path to beach. There is private covered parking and secure bicycle storage. BIKE RENTALS - We have arrangements with Riding Tigers Bike Rentals to obtain discounted pricing on weekly bike rentals for our guests. In the summer, reservations should be made at least 2 weeks in advance as we run out of bikes every week. Our price includes delivery, pickup, locks and baskets. Amenities: Crown Moldings, Corian Counter Tops, Large Veranda, Large Soaking Tubs, Phone, Air Conditioning, Cable TV, VCR, Full Kitchen, Microwave, Dishwasher, Refrigerator, Cooking Utensils provided, Linens provided, Washer, Dryer, Hot Tub (shared), Pool (shared) and Covered Parking. Screened Veranda with landscape view. Unit is located at the end of Ocean Lane in Palmetto Dunes. It is a 1st floor villa with covered parking and located in the last building of a 6-building semicircle.